OBAMA: Republicans have said that this would be a big jobs generator. There is no evidence that that’s true. And my hope would be that any reporter who is looking at the facts would take the time to confirm that the most realistic estimates are this might create maybe 2,000 jobs during the construction of the pipeline — which might take a year or two — and then after that we’re talking about somewhere between 50 and 100 [chuckles] jobs in a economy of 150 million working people. Let’s review some of the facts surrounding this debate. 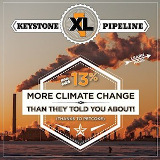 The Keystone XL cost about $5 Billion to build, the President’s advisers (he’s not an experienced business person, let alone experienced with major construction projects or pipeline operations) tell him the project construction will only generate 2,000 temporary jobs and about 50-100 full-time jobs thereafter. In a typical major construction job labor normally makes up about 30% of the total project costs and the project of this scope could take about 2 years to complete. So that means (0.3 x $5,000,000,000 / (2 x 2,000) =), those insignificant 2,000 jobs pay about $375,000/yr. on average each. Not too bad if you can get the work vs. the part-time, low paying jobs that appear to be dominating the recent economic recovery over the past 3-4 years. The new pipeline includes multiple pumping stations, operating controls-facilities, 24-hour manned shift-operations, significant-routine inspections/maintenance, full-time supervision/management and other administration support staff. Limiting this staffing to about 75 full-time positions does not sound like the staffing level would allow such things as vacations, sick leave, avoiding excessive overtime, training, etc. I wonder how many existing unions that operate most other pipeline systems around country would support or tolerate such onerous working conditions. If it’s so easy, why doesn’t he just nix it already? Time to put up or shut up, Barry! If I were cynical, I’d wonder if he was trying to push a decision out past the midterms. The Trump administration is appealing the decision made by a federal court in Montana to block Keystone XL, which is a major $8-billion crude pipeline project of TransCanada Corporation. After being taken to the woodshed by Speaker Pelosi, Trump will try to show Anne Coulter he’s not the wimpiest president in US history. His preferred weapon will be new exec orders in support of fossil fuels and continued deregulation of the.. The issues surrounding the Keystone XL pipeline project are worrying many regarding the economic losses and potential jobs that would be out because of them. Though Trump is eager to see the proposed pipeline become a reality, the project still.. According to this study, lawsuits that advanced climate change regulation exceeded those that opposed it. Specifically, 73% fell in the former category. 60% of all cases were filed to uphold President Obama's climate change policies. Out of 14..